A physician. A scholarly monk. A fantasy writer. A bawdy song and joke composer. These couldn't possibly be the talents of just one man...right? Well, if your answer is yes, then you haven't heard of the colourful French Renaissance humanist, Francois Rabelais. And if the above list wasn't impressive enough, Rabelais was considered such a powerful writer that the word "Rabelaisian" has been coined to describe writing "marked by gross robust humour, extravagance of caricature, or bold naturalism" (Merriam-Webster Dictionary). It somehow seems fitting that such an interesting character have enigmatic origins. There is some dispute over exactly when Francois Rabelais was born. Some say he was born as early as 1483, but the most likely time of his birth was in November 1494. The place of his birth is also uncertain, but he was probably born near Chinon in the Touraine where his father, a lawyer, worked. Rabelais' education began when he entered the Franciscan Order of monks. There he studied Greek and Latin as well as science, philology, and law. He eventually left monastic life to study medicine at the University of Poitiers and at the University of Montpellier. In 1532 he moved to Lyon to practice medicine. Here, he also edited Latin texts. In his spare time he wrote and published humorous pamphlets. Using the pseudonym Alcofribas Nasier - an anagram of his name - he wrote Pantagruel. This book was to become the first of his Gargantua series, for which he became famous. I'll end this brief description of the life of Francois Rabelais with the now famous words that he penned in his will: "I have nothing, I owe a great deal, and the rest I leave to the poor". He died in April 1553. 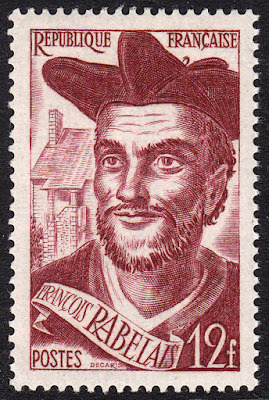 On 26 June 1950, France issued a stamp in honour of the remarkable Francois Rabelais. The stamp was designed and engraved by Albert Decaris. Decaris has done a fantastic job capturing the humorous nature of Rabelais. Just look at that cheeky grin and the penetrating gaze. We just know he is formulating some witty yarn to dazzle his readers.